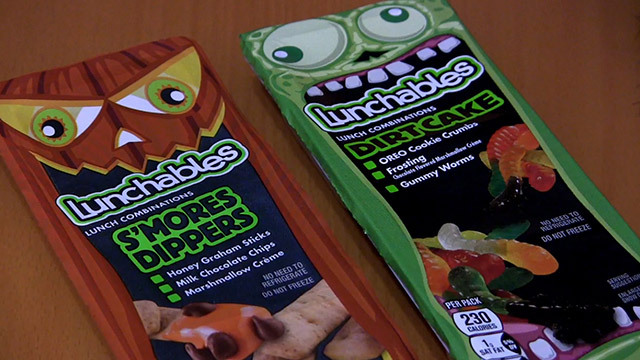 Tonight I’m reviewing the 2014 Halloween Lunchables dessert packs, which include “S’mores Dippers” and “Dirt Cakes.” They’re actually modified versions of things Kraft sells all year long, but the new spooky packaging is to die for. S’mores Dippers: My favorite of the two. They’re basically inside-out s’mores. I have a vague recollection of Lunchables sneaking these out late last year, but the packaging is definitely all new. Love that Kraft is continuing this new tradition of “holiday Lunchables,” but I do hope we get a proper “lunch kit” to go with them! I’m very glad to revive one of last year’s recurring features: CLASSIC CREEPY COMMERCIALS! In this series, I blather on about ancient TV commercials, each with some loose tie to the Halloween season. For the third year in a row, I have my friend Larry P. to thank for the ads, which were culled from his concerningly large VHS collection. Thanks so much, Larry. It wouldn’t be Halloween without a 900 gigabyte zip file from you. 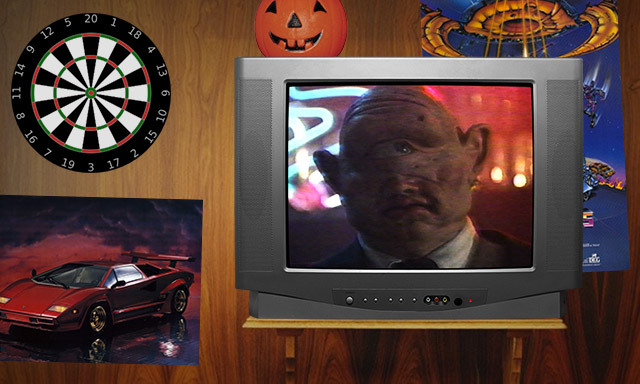 Nothing can throw you back into Halloweens past quite like spooky old television commercials. Below is the first batch for this year, starring everyone from Elvira to a former Olympic hopeful. And Beetlejuice! After you watch this commercial, watch it again. Really process what you’re seeing, because what you’re seeing is so goddamned odd. Here, a lovely barfly sings about how she doesn’t want Mr. Wrong, and if I’m following things correctly, “Mr. Wrong” is every guy at the bar who forgot to wear deodorant. Since it’s hard to convey how bad someone smells through visuals alone, all of the non-deodorant guys are represented as literal monsters. For a 1985 spray-on deodorant commercial, I’m impressed with the creature effects. My favorite has gotta be the one-eyed bald alien, but that mummy is a close second. Between the ghouls and the bar, I’m reminded of the Mos Eisley Cantina. Maybe the singing woman is a younger Ackmena? Continuing with my “Five Random Action Figures” series, I thought I’d make this edition a little more appropriate for the Halloween Countdown. This time, our five random action figures are all TERRIBLE MONSTERS! 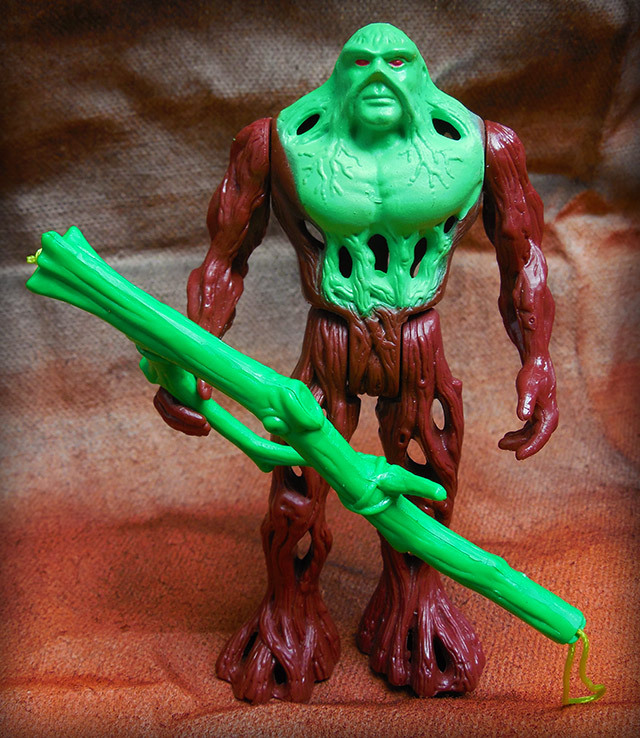 There were several different Swamp Thing figures available, of course, and Kenner did a great job in differentiating them. One Swamp Thing glowed in the dark. Another had his left hand attached by a string, to serve as an organic snare. A third could actually fall apart, into what was supposed to look like a pile of harmless branches, even if it really just looked like a dismembered Swamp Thing.